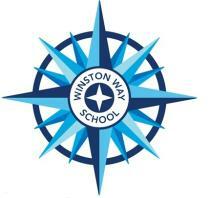 At Winston Way Primary School children, staff and parents will work together in partnership to enable all of our children to reach their potential. We endeavour to equip children with the skills needed for lifelong love of learning whilst maintaining high standards of achievement and behaviour. We expect our children to leave the school as active, independent and confident learners. We create a calm and inviting atmosphere that encourages our vision within an ethos of mutual respect and integrity. We expect adults alongside children to persevere and be creative in their experiences.